So hilariously enough, when my culinary interests peaked along with the sales of the famous Fifty Shades of Grey trilogy, my parents bought me a “50 Shades of Chicken” cookbook. It’s narrated as a saucy parody, but is chalk full of recipes and techniques. 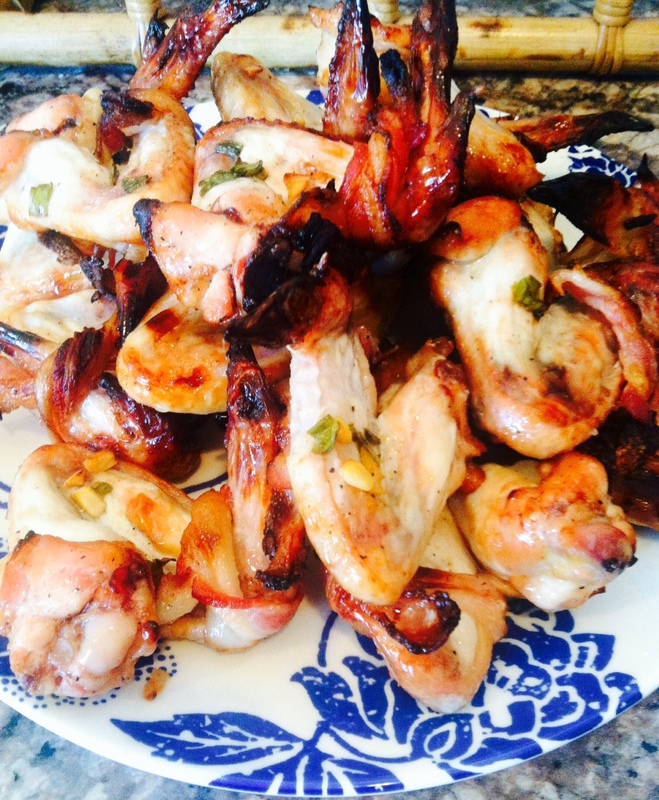 One of my favorites is the maple-glazed wings with bacon (the narration entitled “Bacon Bound”), the obvious reason being the use of a key word in my vocabulary, bacon. Serves 4 to 6 people, or just me, myself and I. 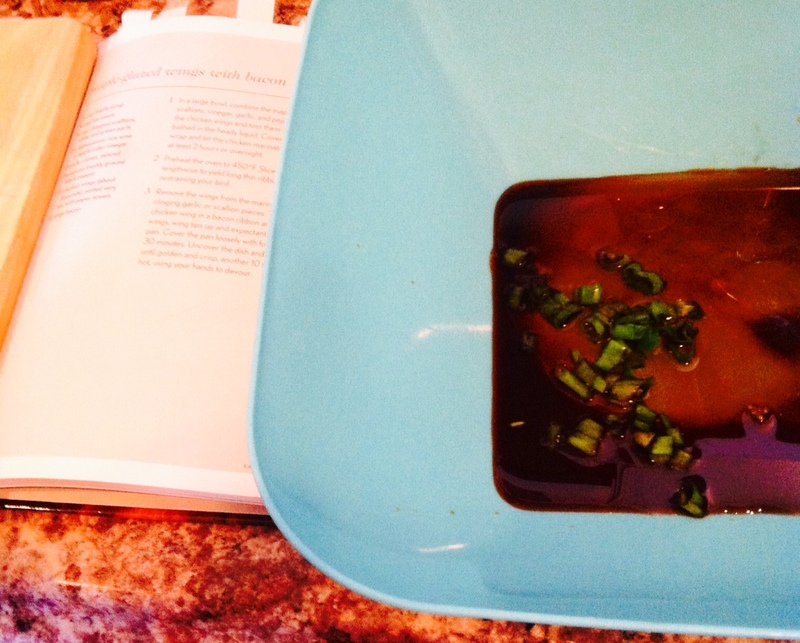 In a large bowl, combine maple syrup, soy sauce, scallions, vinegar, garlic, and pepper and mix well. Add the chicken wings and toss them gently so they are covered. Cover the bowl with plastic wrap and let the chicken marinate in the refrigerator for at least 2 hours or overnight. Preheat the oven to 450 degrees. Slice the bacon in half lengthwise to yield long thin ribbons (“perfect for restraining your bird”). 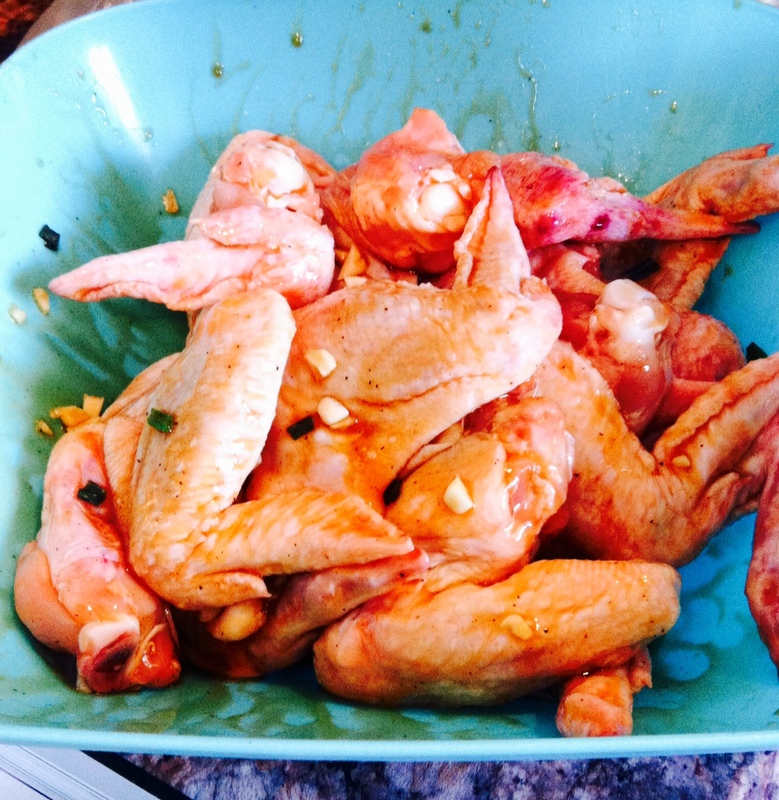 Remove the wings from the marinade and wipe off any clinging garlic or scallion pieces. 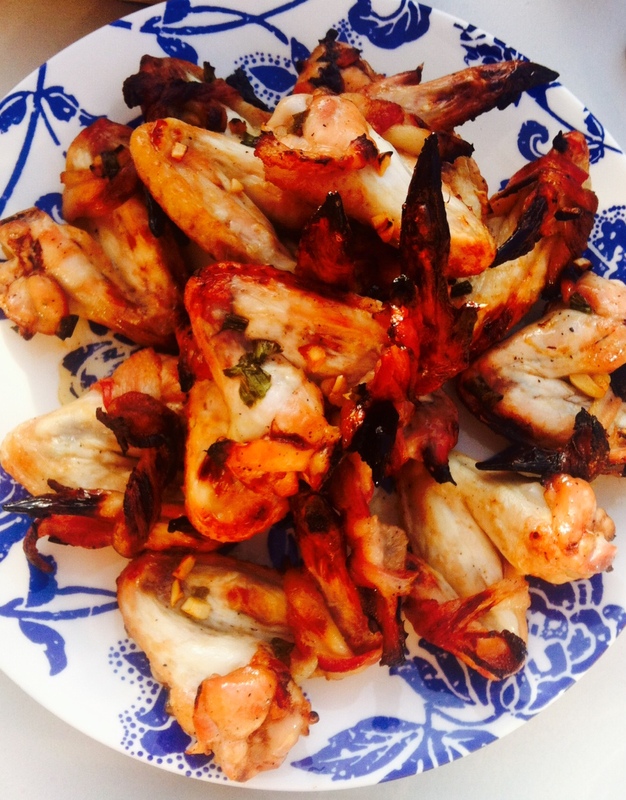 Tightly tie up each chicken wing in a bacon ribbon and lay the chicken wings, tips up, on a large baking pan. Cover loosely with foil and bake for 30 minutes. Uncover the dish and continue to bake until golden and crisp, another 10-15 minutes. 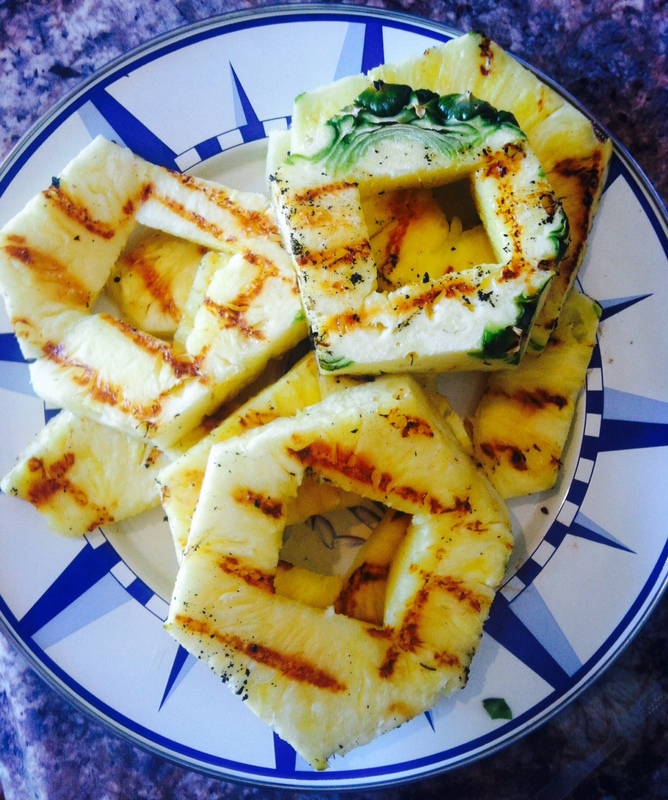 For a burst of contradicting flavor, pair with grilled pineapple! 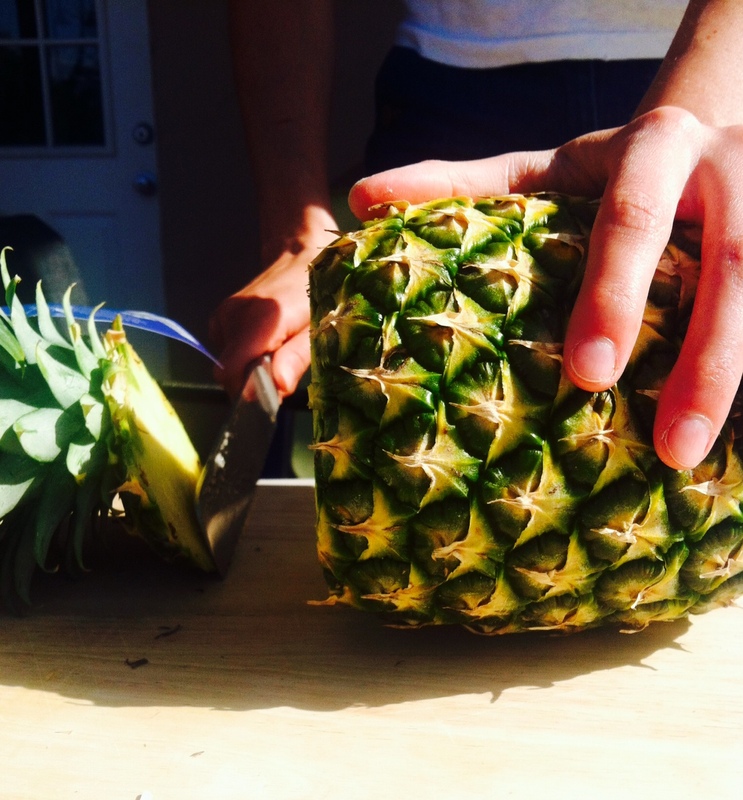 Buy a whole one, cut across for chunks that are an inch or two thick. Cut around chunks to remove the outside. Toss on the grill for a few minutes on each side. And if you’d like to surprise a fellow carnivore with a lovely present, shop for the cookbook! Happy Friday slash Post-Halloween slash First Day of November! I hope you all enjoyed a candy-filled Hallowed eve and are currently still in a sugar hangover. 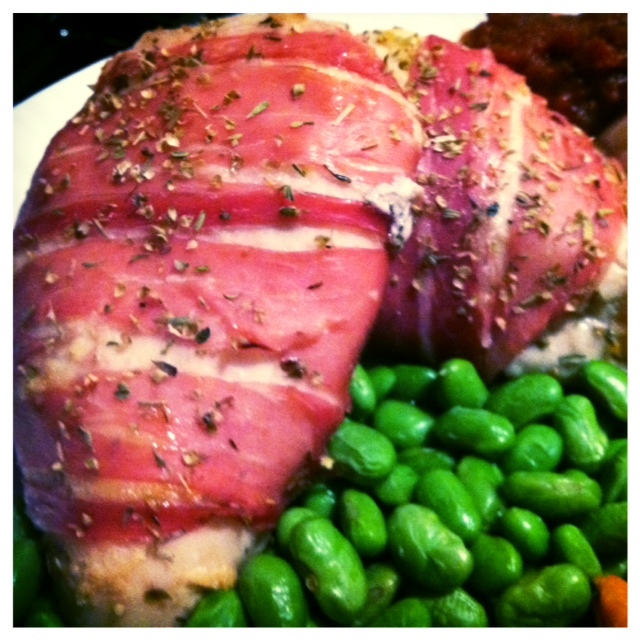 Today’s recipe features a protein-packed dish that may help assuage any chocolate guilt: prosciutto-wrapped chicken breasts! These are healthy, flavorful, and combine two of my faves in the carnivorous world. A scrumptious side (I went with steamed Edamame in Picture 1 and homemade Caprese salad with Spanish olives in Picture 2). Preheat oven to 350 degrees and cover a baking sheet in cooking spray. 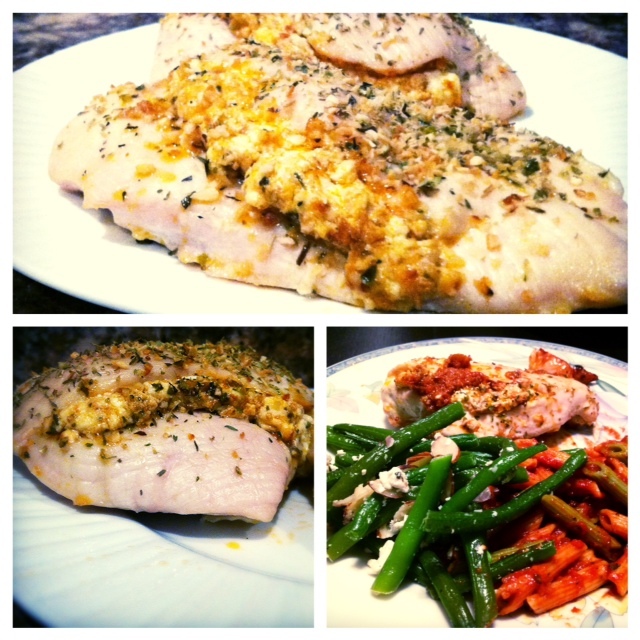 Sprinkle oregano and garlic on each side of the chicken breasts. Next take 1 slice of prosciutto and wrap around the middle of the first chicken breast. If you have enough prosciutto, feel free to take a second and wrap around the same breast, either doubling over the first layer or wrap at an angle so the prosciutto covers more of the entire breast. Repeat with remaining chicken breasts and prosciutto slices. If desired, sprinkle another layer of oregano over the breasts and place on baking sheet. Bake for 20 minutes and check. The first time I did this, I baked three breasts and upon checking at the 20 minute mark, had to bake for an additional 10 minutes. 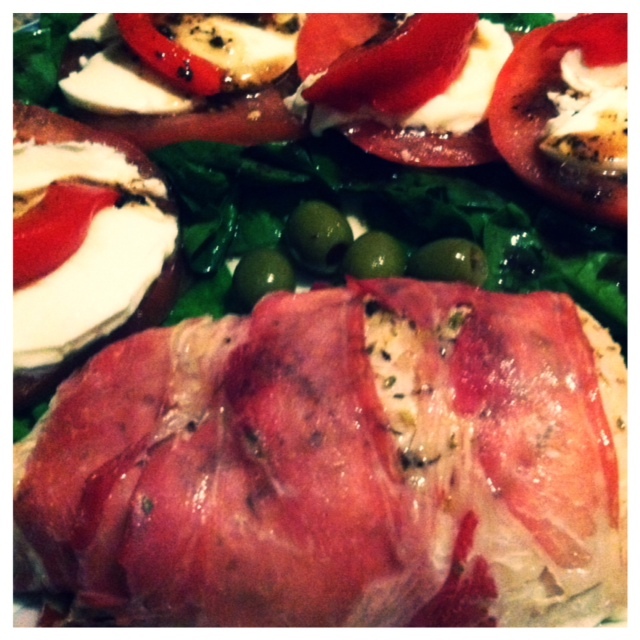 Remember, the prosciutto is insulating the chicken and while keeping it SUPER moist, also prolongs the baking process. When appropriate, remove from the oven, pair with that healthy side and enjoy. These will smell AMAZING so you may get some scavengers if anyone else is around. You’ve been forewarned. What is a better/easier way to dine in the sweet summertime than a massive bowl of grilled goodness?? The key ingredients: a healthy starch, protein, and veggies. 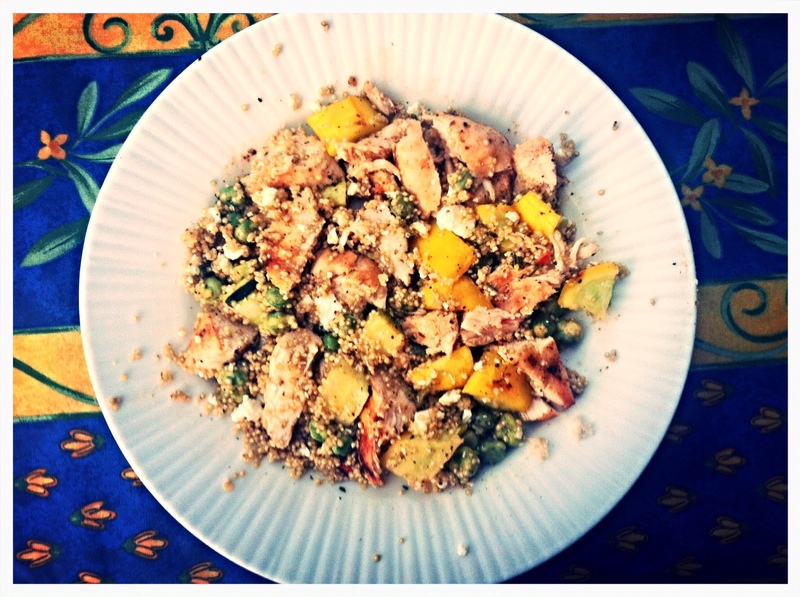 For this week’s Grill Bowl, I purchased one box of cous cous (comes in several flavors, like Rosemary & Olive Oil), two chicken breasts, one small yellow zucchini, and one small green zucchini. All simple and very affordable. -Slice and dice the two zucchinis how you like. Cut in long, thick strips if you are going to lay them directly on the grill. Dice up in chunks if you have a grill pan. Thinly coat with olive oil, salt/pepper those bad boys, and grill for a 5 minutes or until soft. -Choose your favorite grill rub (I use three different ones usually- hint: one is LOTS OF GARLIC POWDER). Coat chicken with rub and toss on the grill (high heat). Grill 3 minutes each side or until tender pink. Cook cous cous as instructed on back of the box. Dice up grilled chicken and zucchini. I threw in some Feta cheese I had in the fridge, some wasabi peas (a casual addiction of mine, buy them at Harris Teeter! ), and tossed the mix with a light greek vinaigrette also hiding in the fridge door. Bon appetit!! Share the Grill Bowl with 1-2 other pals and enjoy the summertime goodness!